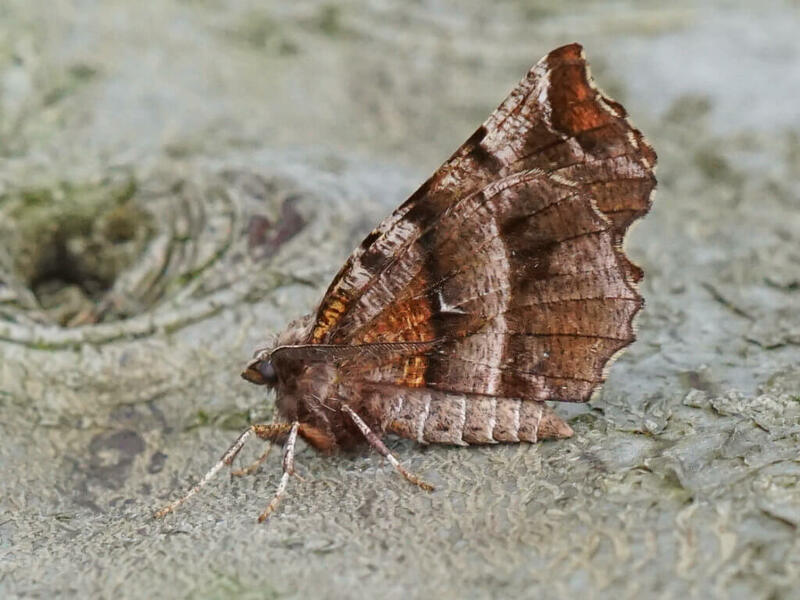 Paul writes: the Early Thorn (Selania dentaria) is one of the commonest moths flying at the moment. I usually see them from mid March to the end of April, they have two broods so will appear again in the middle of July. I found this one a couple of weeks ago in my North Yorkshire garden. They fly from dusk onwards and come to light easily so often land on windows of well lit rooms without any curtains drawn. They are fairly recognisable as they always land with wings held up over their back and tightly pressed together. The white chevron, on brown and orange wings, is also distinctive This one had a forewing of around 20mm but the summer ones can be much smaller. They are common and well distributed throughout the UK, larval foodplants include Hawthorn, Blackthorn, Honeysuckle and other common woody plants so are likely to appear in most gardens.